Dedicated, of course, to the memory of Dave Stevens. This is really sweet, dude! I love the lighting, and open line style. Ditto! This is another really cool one, and the muted colors (although that might just be my crummy monitor talking) are sweet. Great piece! A lot of story in such a good, strong and simple composition. I love this! I really love how both with this piece and your Zorro, you created moments that I feel like we're just getting a glimpse into. Almost like stills from a movie. Beautiful work! Uh-oh - it's the Nazis! I love this. The colours, the mood... There's almost an African heat outside that doorway. Brilliant. And you do the *best* boots. Dan -- thanks so much! It's really gratifying that you got the desert heat thing I was going for. Color is awesome that way - how it can tell so much of the story. But no way do I draw the best boots. Edvin Biukovic drew the best boots. Every time I draw a pair of boots, there's this one panel of his, I think from the first page of Devil's Choices, that flies into my head. It still makes me sad to think of what the world of comics lost when they lost Edvin. And Dave Stevens, too, of course! So many great stories we'll never get to read! Great stuff! Love the colours but it's the composition that does it for me. 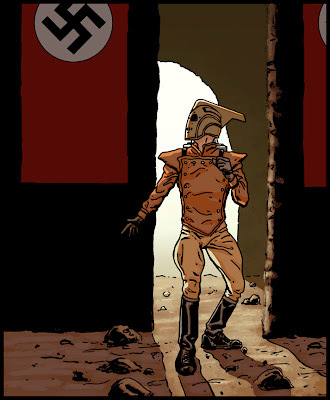 While all of these images are awesome, this one is, by far, my favorite of the ROcketeer bunch. Thanks for doing this Twarters! I'm enjoying the heck out of it! Absolutely love it, Nathan! The composition really draws me in. I want to know what Cliff is about to discover in there. Oooh! Very nice! The linework reminds me of Bernie Mireault. Thanks everyone for your kind, kind words!